With a full week of jury duty, work was limited. I found time in the evening to finish hooking on the body section of the latest work. I also decided to name the piece "Metropolitan". 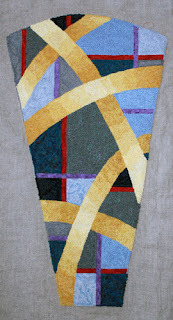 Titles can be important to viewers and it took me a while to name this work. 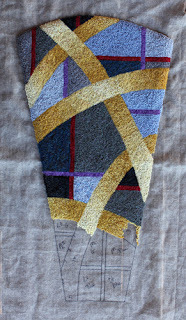 I like a title that people can relate to and perhaps help them to see something in the work. 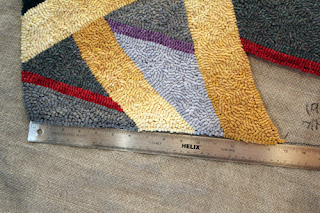 A title should not give a total explanation of the work, but allow the viewer to experience the piece on their own. We have been on the road extensively this year and the piece shows the city blocks we have maneuvered along with their corresponding highways and overpasses. Many others have had the same experience. 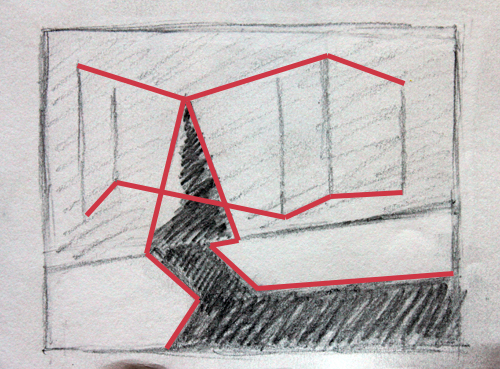 I like that people can recall their own memories of travel through the road pieces I've created. One title of a work that starts a series can lead to many more. Future titles I have in mind refer to roads we have driven. "Neck of the Woods" from our experiences four-wheeling in our Jeep through the back roads of the mountains is one example. "Pacific Coast Highway", and "Rodeo Drive" will derive from visiting our daughter in the L.A. area. 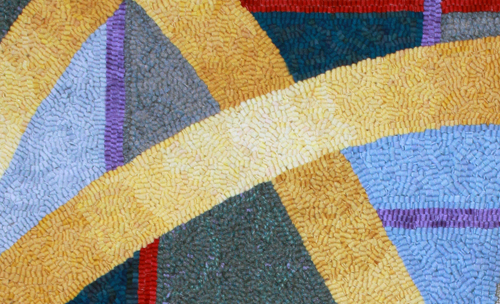 I look forward to delving into the colors that surround each of these areas and incorporating them in the work. 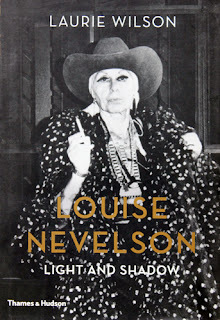 I know very little about Louise Nevelson except that I have loved her work forever and who can resist a woman who dresses like the one on that cover. I really need to spice up my closet. 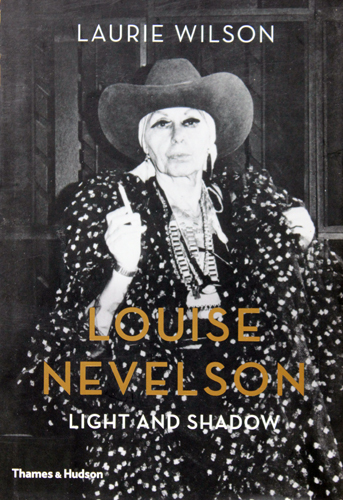 Anyone for a Louise Nevelson party? Nevelson is known for her monochromatic wall pieces made from wood. I have this weekend all to myself, so I plan on settling down and getting a good chunk of reading in. 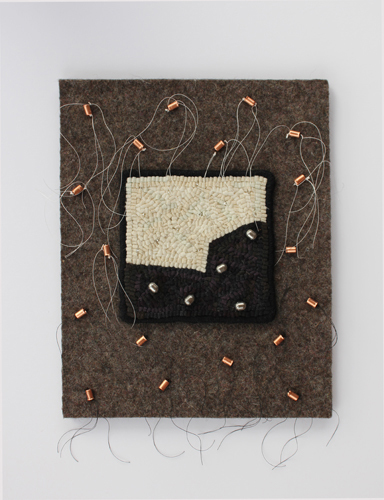 You can see examples of her work at Artsy. Look over titles you have chosen for your works or look at titles on the internet or in museums. Do they make you think about the piece, bring back memories or relate to your experiences in any way? The white threads are on the top sections and the black threads on bottom. While black threads are seen hanging off the bottom of the piece they are more hidden on the piece itself. 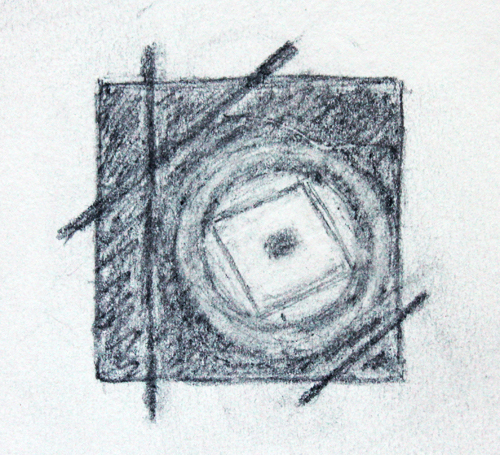 They are seen clearly when the viewer approaches the work. The plan right now is to create a grouping of 10 to be hung together. While on the ride home from Vermont, we stopped on a bridge which looked down on a crossroad. The lighting was creating a spotlight effect on the roadway and surrounding area. This piece developed from that scene. The outer areas are darker and progress to lighter with the focus area being the lightest. I also added a metal bar to the left side which balances the work. Having been a psychology major as well as studying art I find the spotlight effect interesting. In psychology it refers to one thinking they are being noticed more than they actually are. 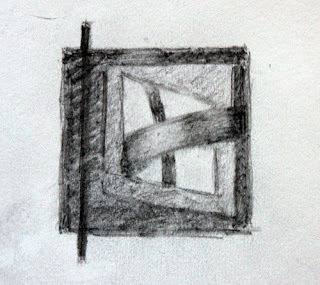 In these pieces something is spotlighted that we usually pass right by and don't give much thought to. This piece was developed from a round drain on the road which had light shining on it. The same spotlight effect used on the piece described above was used here. There will be more contrast between light and dark on the actual work to bring out the brightness of the focus area. Try to find areas that are spotlighted, whether by interior lighting or exterior lighting. How does this affect the color of the object and the surrounding areas? A special thank you to all for the sympathy calls and cards received upon my mother's death. 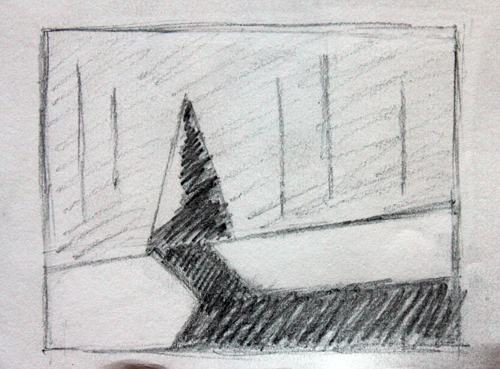 I have been off my game and a bit unfocused. I am now finding my way back to where she would want me to be. When working on a piece with a specific shape to it measuring is important. 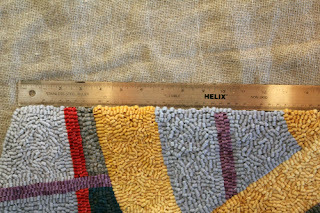 In the photo above the ruler is placed against one of the angled edges to make sure everything is aligned. When I measured the other side, it was off by about one line of hooking where the light yellow and light blue are seen creating a bowing effect. This was filled in to keep the angle of the side of the piece in alignment. I will keep measuring at certain intervals as the piece is worked on. We had some beautiful weather here this week so I decided to sit out on the deck with a glass of our homemade wine (not too bad for our first batch) and do some sketching. The sun was shining brightly leaving some great shadows to work with. I took the liberty of adding the sky to this work. In reality, the background was filled with pine trees. About 3/4 of the tree was in dark shadow with the left 1/4 in sunlight. The shadows were lengthy as it was morning. They were also narrower than I would have guessed. I learn something every time I work outside. Some of the best shadows are at sunrise but I'm not a morning person, so I frequently miss that opportunity. This sketch kept to an abstract look. 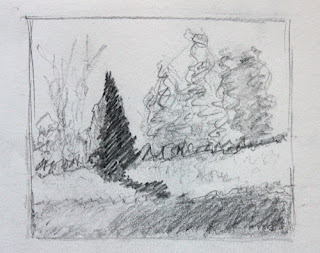 The darkest value is from the shadows that were viewed, the light value is the gravel road and the medium values are the pine trees in the background with certain trees represented by thin lines. Here I marked off patterns. There is a repetition of sharp zigzag lines throughout the work which give a sense of action and tension in what is in reality a peaceful scene. We will be talking about realistic vs. abstract, composition, lines, light and value in the Plein Air class I will be teaching at the Green Mountain Rug School next June. See how many types of line you can find in an outdoor landscape scene.